I purchased this blazer just over a month ago at Banana Republic Outlet in the clearance section. Typically red is more of an accessory color (or better yet, a lip color!) for me. I tend to pass it off as something too bold for my personality. Nevertheless, it was marked way down to less than 25% of its original price with an additional 15% off (thanks teacher discount!) and fit really well so I couldn't help, but purchase it. If I am on the fence about something I often purchase it and try it on at home to see how versatile it is with my other clothes. With the price, fit, and versatility, it clearly found a permanent hanger in my closet. It was perfect to pull out for Valentine's Day! Adding a bold red or pink is really all you need to do to be festive which is easy enough. There is so much range when you want to dress for a holiday like Valentine's Day. You can go all out with hearts, lace, and festive colors, or just add one colored item to your outfit. Hope you all have a wonderful Valentine's Day no matter how you celebrate or what you wear! Great blazer! Love the white top! You look so great in red and I am loving that tiered top. My red blazer is one of my faves and even though I don't wear it often ever time I do I wonder why. This is the perfect Valentine's Day look! 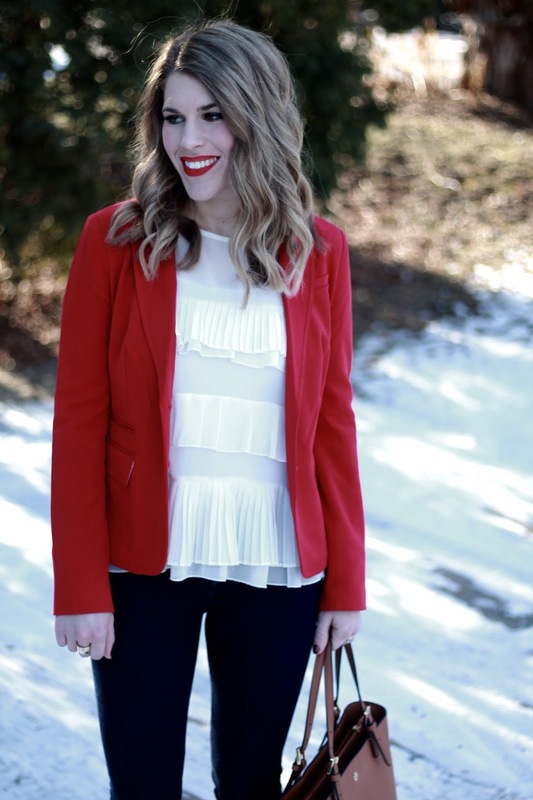 The blazer is a beautiful shade of red and I adore the elegant ruffled blouse underneath. 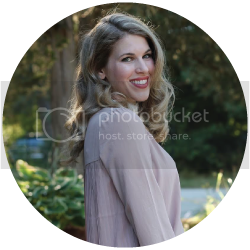 Thanks so much for the link up and I hope you enjoy your Valentine's Day! You look amazing in this red blazer, Happy Valentine's Day! Simply stunning! Love the red blazer! You look so pretty in red! I love your ruffled blouse! Happy Valentine's Day! Oh how I love a red blazer. I used to have one but I guess it didn't make the purge. Darn it! Love, love, love yours! Great look! 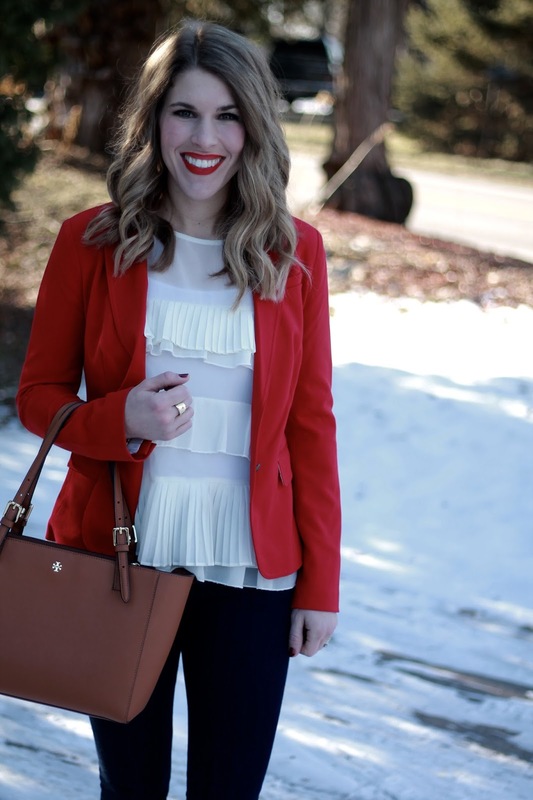 The pretty top looks great with the red blazer! I love the Banana Republic clearance section - such great deals. And I love your strategy to determine if an item truly works with your wardrobe. I'm glad you got this Laura (we get some of the best deals from Banana Republic too) because it's perfect on you. I bet you felt the same way about it at first that I did when I got my pair of red jeans. Like I just wasn't sure they would go with much and did I want to stand out so much? But the more I wore my jeans, the more I love them. And I bet you'll feel the same about this jacket!!! 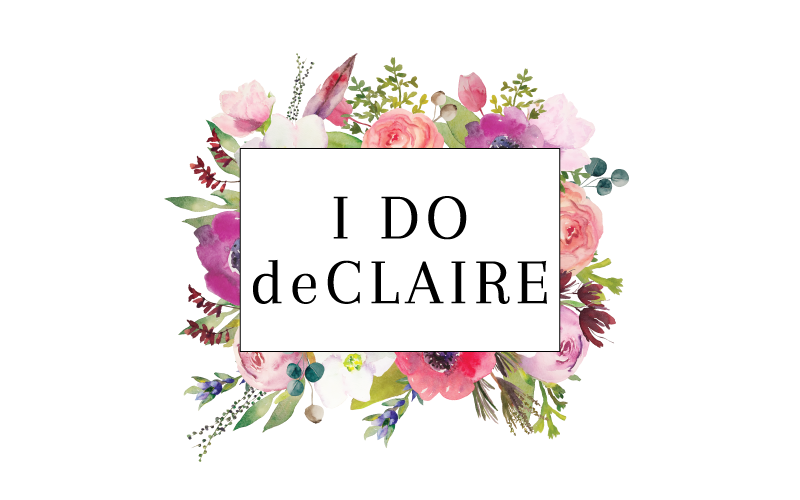 You are so Valentine's Day ready! This dark red is perfect on you! What a perfect Valentine outfit for a work day! What a gorgeous Valentine's outfit! Red looks beautiful on you and the ruffle top is so pretty! Love this blazer, what a steal with the mark downs! You look great. 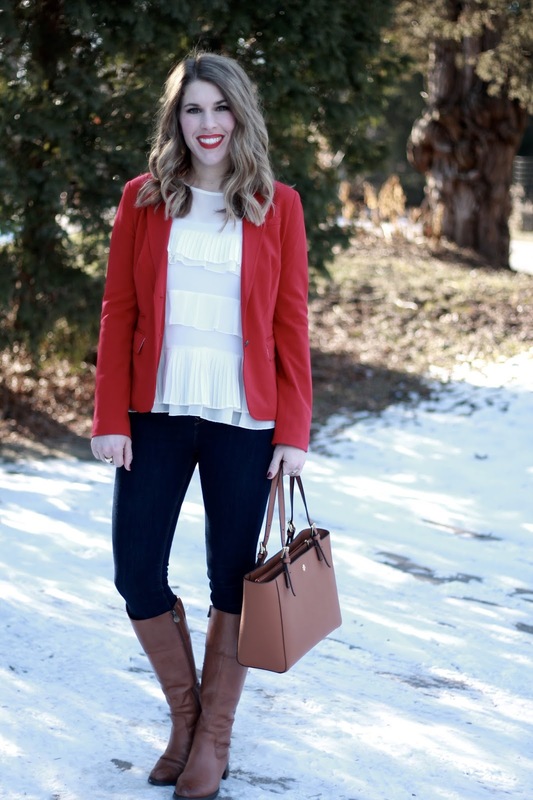 Loving this red blazer on you, so perfect for Valentines! Your top is so pretty too. Great look Laura! I think you look great in red Laura! That top is lovely , romantic and perfect for Vday. This blazer is so gorgeous, lady- and perfect for Valentine's! 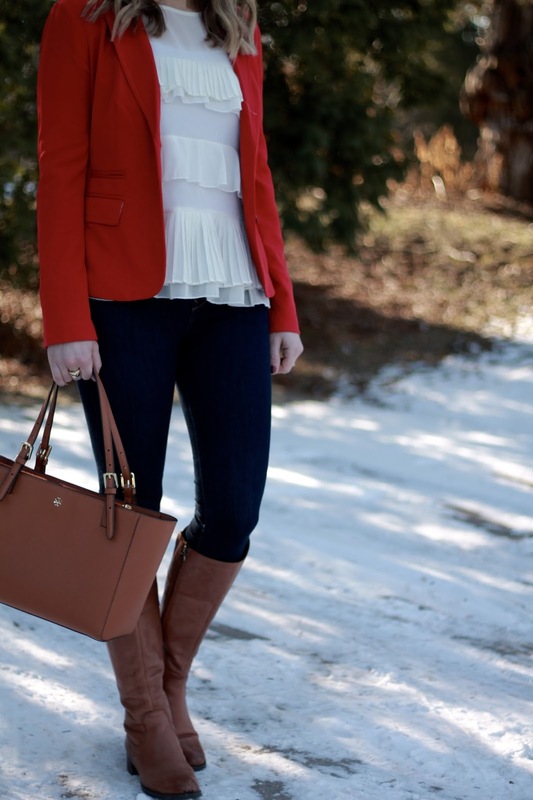 I love the red blazer on you, and it looks perfect with the ruffle top! Such a pretty look! You always look beautiful in red lips. Love the jacket too! I have been on the lookout for a red blazer, so now I am going to check my local Banana Republic outlet. Your top is simply gorgeous! Fabulous Valentine's look. I don't have a lot of red pieces either, but I do like to bring them out during the holidays or V-Day. That white top is so pretty with all of the ruffles! Banana Republic Outlet has great blazers, I got my navy one from there. Such a beautiful outfit!!! :) love the red blazer! I like how you style the jacket with the romantic blouse. A well fitting blazer is always a must, and I think the bright red looks fabulous on you. So gorgeous! I am the same way, I don't often wear red. On the rare instance that I do I always get compliments- maybe we should boldly wear it more! Wonderful look and thanks for hosting. What a great blazer Laura. It fits really well. All Banana Republic stores here closed last December, which was a true bummer as now I look at garments like this and know I cannot find them locally. You look fabulous in red, Laura!!! Love the blazer and bold lip. Happy Valentine's Day! You look so pretty in red. I love this blazer and that ruffly top! Happy Valentine's Day! Such a lovely top ... and love the added punch of colour the jacket gives the outfit.. This top is seriously so adorable! I love it with your red blazer! You wear red like no one's business! And the red lip! Swoon! I love how you paired the blazer with the frilly blouse! You look GORGEOUS! You look so amazing in red and what a wonderful top to layer underneath! Such a beautiful girl you are! 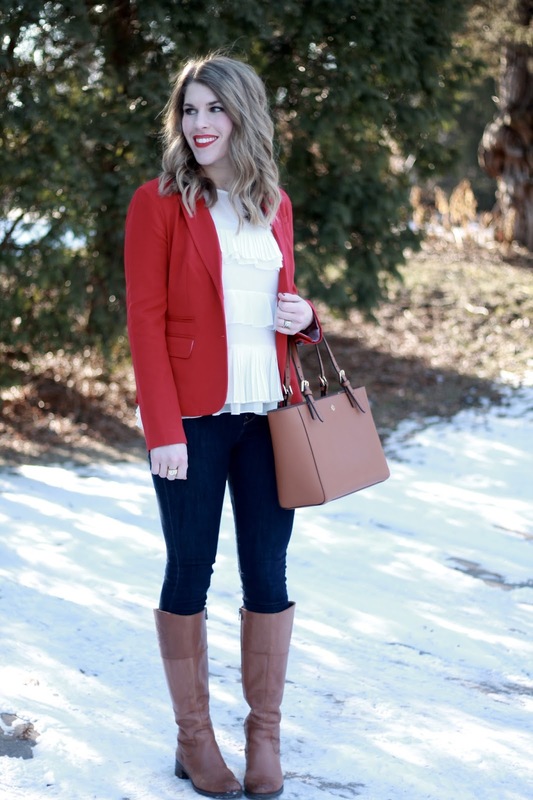 I need to add more red to my wardrobe, and this blazer is perfect! Love the pretty blouse too. Beautiful outfit! 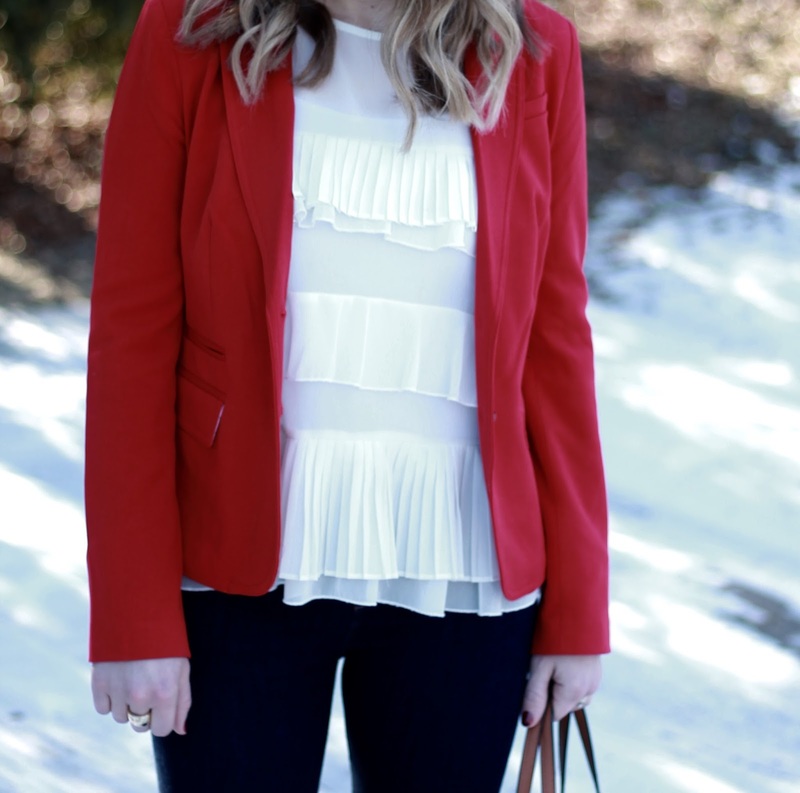 Love your feminine ruffled top, so sweet and it's the perfect contrast to the bold red blazer!! Thank you for the link up. 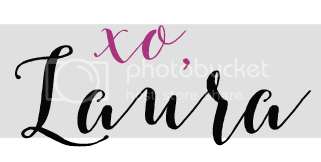 Come on over to Shoe And Tell and link UP on Style Nudge! I love the red blazer! It is perfect with that pretty white blouse on you.